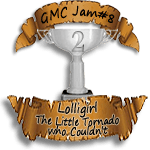 GMC Jam #8: 2nd place! So, happy news for me as a programmer! The Game Maker Community Jam #8 competition was held recently. The GMC Jam is a competition with an average of over 50 entries that occurs once every three months on this large programming forum I frequent; each entry has to be made within the 72 hours from the late Friday to the late Monday during which it’s held. I met the Norwegian friend with whom I’m staying because of the GMC, so we’re both programmers and decided to team up and make a game. Our brainchild/game came in 2nd out of 62 entries! Download a copy of “The Little Tornado that Couldn’t” by clicking “Games” on the top bar, or just by clicking here.